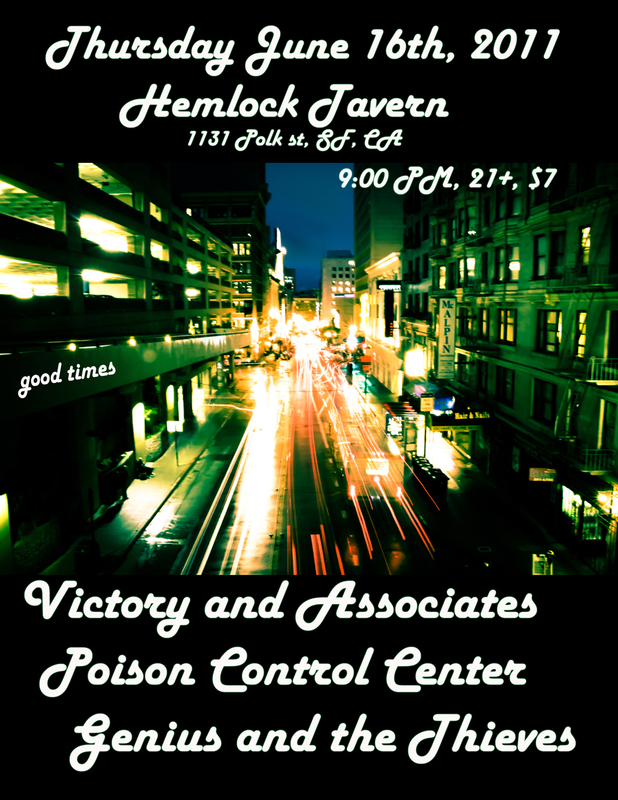 Victory and Associates » Next sf show with Poison Control Center! Next sf show with Poison Control Center! Hi! We are taking a short break from album land to host this incredible show. We are proud to announce our next SF show is with Ames, IA touring power houses. Poison Control Center. A ferocious and fun rock and roll powerhouse that is to be reckoned with. This show is NOT TO BE MISSED. Opening the show are local awesomes Genius and the Thieves. Thursday is the new friday people, let’s get down to it. Hemlock Tavern, SF 06/16/2011. Posted in Flyers | Comments Off on Next sf show with Poison Control Center! « We did it! Record being mixed this week.